Texet 8 Digit Calculator. Dual powered. Auto power off. Calculators help you whiz through tricky math problems and display their answers on bright, easy-to-read screens. Calculator,Office /Desktop /Standard Function/Scientific Calculator with 12-digit Large Display Solar and Built-in battery Dual Power.Economic, affordable, practical,perfect is suitable for family,office,school,engineering,finance etc. Double Zero Key. Back Space Key. Key Rollover. Key for changing Plus/Minus Sign. Correct Key. Two Way Power. Weight: ca. 130 g. Plastic Keys. Part-manufactured from recycled Canon product material. 10 digit mini desktop calculator with dual power. Large display. They will require a signature. HP Cashback. Stylish design for your lifestyle. Giant Calculator. Pop Up Screen. Large, Easy To Use Buttons. Large Buttons Allow Easy Use For The Visually Impaired. 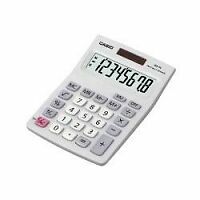 Casio HR-150RCE Printing Calculator Adding Machine Mains Adapter Battery Powered. Brand new, never taken out of the box. Selling as item was a duplicate gift. According to the box 4xAA batteries are provided as well as a mains adaptor. Command signs. 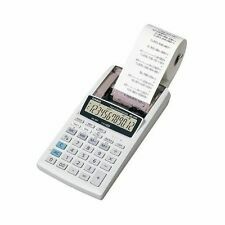 The HR-8RCE is a 12 digit display Printing Calculator. The HR-8RCE also has functions such as 3 comma markers, double zero key, and a backspace key. LCD display. 2.0 lines per second. Angled best view display. Dual Power. 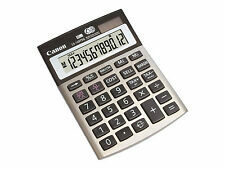 The reliable Casio MX-8S 8 Digit Desktop Calculator is ideal for fulfilling all your basic mathematical needs. With a great easy to view large angled LCD display screen and non stick keys the compact MX-8S is the perfect accompaniment for your desk helping you with all your general day to day problems. Canon AS-12012-digit mini-desktop ‘green’ calculator with arc designThis 12-digit mini-desktop calculator features the arc design enabling it to suite all professional offices. 12 digits. Pink colour. 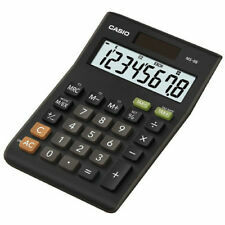 Casio MX8B-WE White Multi Functional Desk Dual Calculator 8 Digit Display. 8 digit display. Angled best view display. Key Features. 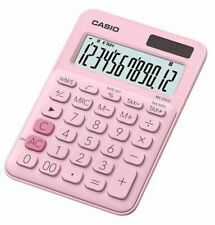 The Genie 12264 Calculator, Pink. This simple and elegant Girls Calculator is ideal for School or College where a non scientific Calculator is required. Battery Included with this GeniePink Girls Desktop Calculator.